first lighthouse on the Mississippi mainland. 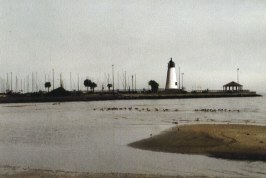 In 1829, Congress authorized a lighthouse at Pass Christian where the channel passed close by the beach, and $500 for buoys to mark the outer turns. An Army engineer advised against the expenditure, arguing the pass carried “only five feet of water at common tides, and at low water, no vessels may pass through it.” Packet and mail steamer skippers disagreed, however, and continued requesting that a beacon be placed to aid navigation through the tricky bars and passes. By ths time, the Mississippi and Alabama cotton trade was booming, and the Mississippi Gulf Coast was attracting steamboats that were loaded with vacationing passengers. 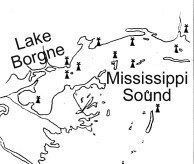 An early promoter of Gulf Coast lighthouses and fortifications was Edward Livingston of Louisiana who also owned the vast acreage of the entire peninsula of Pass Christian – from the Bay of St. Louis to Bear Point in present day Long Beach. The half-acre Lighthouse Lot was sold by U.S. Senator Livingston to the U.S. Government for $250 in 1830. Winslow Lewis won the construction contract to build both the Pass Christian and the Cat Island light towers for a combined $9,283. The first keeper, Roger A. Heirn, also supervised construction. 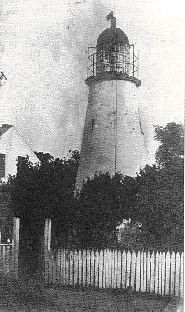 At a cost of $4,897.50, the tapered brick lighthouse was of the smallest class built by the government at the time. The 10 lamps, in a Fourth-Order lens, were held 28-feet two-inches from the ground and 42 feet above sea level as it was seated upon a 14-foot ridge, one of the highest points in town and nearest to the actual Pass of Christian. The lighthouse lot measured 104 feet by 208 feet setting back a distance of 60 feet north of the shoreline at the high-water mark. At ground level the outer base measured eighteen feet wide with 3-foot thick enclosed walls. The tower tapered off at the top to an outer width of ten feet and seven inches with a wall thickness of one-and-a-half-feet. The masonry tower was finished in stucco and painted white. Set atop the tower was its lantern of nine panes of glass measuring six-and-a-half-feet in diameter, and standing six feet high. The lantern was topped with a 3-foot, 2-inch iron cowl dome, which was surrounded by an iron balustraded deck. The ridge upon which the lighthouse stood was 19 feet above sea level thereby providing sea visibility for 12 nautical miles. In all, the Light stood about 55 feet above sea level at the crest of its dome. Behind the light tower was the Keeper's dwelling which consisted of two bedrooms a fire place, and front gallery. Roger Heirn accepted the post as Keeper on July 1, 1831, but the station was not put to use for almost six months. The U.S. surveyor at Port Pontchartrain complained that the government had not supplied oil for the lamps. Meanwhile, the Pass Christian waterway was lit before a lighthouse was in operation. The captain of the mail steamer on the New Orleans-to-Mobile run paid Heirn $.50 per night to keep a pinewood fire blazing on the beach. This light was a family station for the next 30 years. Roger Heirn was relieved by Finley B. Heirn in 1839, also becoming the town’s first mayor (Recorder) in 1848. He was followed by his sister, Miss C.A. Heirn who was appointed in 1844. She was employed by the United States, and during the Civil War, with the Confederate States lighthouse services. 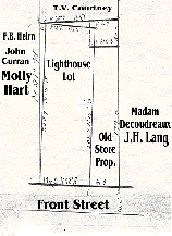 Miss Heirn continued in the job until the light was extinguished on about July 7, 1861. Three other women were appointed keepers of the Pass Christian Light: Mary J. Reynolds, who had been the pre-war keeper at Biloxi, followed by Sally A. Dear, and then Alice S. Butterworth. During 1854, as other lighthouses along the coast were being repaired, the Pass Light’s stucco exterior was patched and the tower whitewashed. Windows were re-puttied and new cement was put around the window frames. The Keeper’s cottage had a front gallery added, the roof replaced with new shingles, and ceiling and floor joists were repaired and finished. Pass Christian experienced a building boom in the 1850s, which drew even more passenger steamers. However, interfering with navigation and blocking the beacon, was the raised cupola atop the store alongside the lighthouse. In 1859, the Light-House Board proposed to move the light farther down the beach. A lantern was already being fabricated in a northern foundry for a new lighthouse there. The local engineer was unable to sell the old real estate for a price high enough to buy a new site, so he proposed raising the height of the lantern by 20 feet by erecting a “parapet wall” atop the masonry. The new lantern was altered so long bolts would extend through the wall extension into the original brickwork. The new lantern was shipped to Mobile Point, but the war intervened. It was found once more after the Federal seizure of the Coast. On January 3, 1866, 32 citizens of Pass Christian petitioned for the Light by stating, “We, the subscribers, residents of Pass Christian, Mississippi, would respectfully and earnestly set forth that the interests of this part of the Gulf Coast greatly suffers for the want of the public Light formerly sustained by the General Government at this point. “Important Literary Institutions and Schools have been established on this coast, the success of which as well as the convenience of the public depends much on the means of access afforded by the steamers from New Orleans and Mobile; which steamers fail to come in, and assign as their reason, the want of said Light to guide them in their approach. The interest of the Coast, therefore, being thus seriously affected, your petitioners speedily restored.” Signed with 32 names. The station was overhauled for relighting on August 15, 1866, by keeper E.F. Johnson, who served until September 1871, and was succeeded by Laurence Hyland. 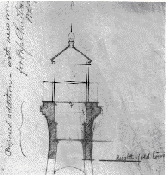 Lighthouse Engineer Max Bonzano intended to raise the building according to the 1859 plan, but instead, increased the height by only two feet and added a cornice to receive the lantern shipped before the war. On April 16, 1873, Keeper Hyland was replaced by Mrs. Maria Reynolds, who was the former Keeper of the Biloxi Lighthouse prior to the Civil War. She served until January 1874, when she was replaced by Mrs. Sallie Dear as Keeper on March 1874, who in turn, served until the Light was closed in September 1882. In 1878, the Light-House Board announced it would execute the 1859 plan to clear the tops of trees and houses. Trees had grown up on adjacent property and they were reducing the effectiveness of the light. The owner of the trees refused to cut them down or even to trim them. In 1879, there was another recommendation to increase the tower’s height – by 10 feet. 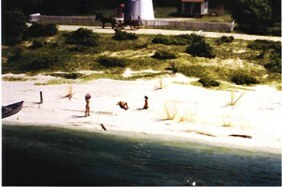 However, the Lighthouse Board resolved that the station be discontinued and the Light went dark on September 14, 1882. 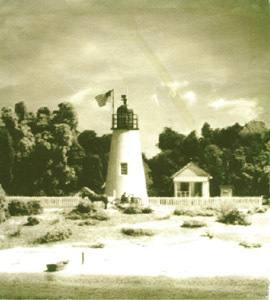 As a result of the Light-House Board’s action, Congress considered punitive legislation to force re-establishment of the light, – but the Board members argued that it had been created by Congress and did not need permission for discontinued use. Ship masters plying the sound petitioned for the bill and the proposed $6000 appropriation. However, the measure failed 41 to 55, and the light tower was discontinued effective October 1, 1882. 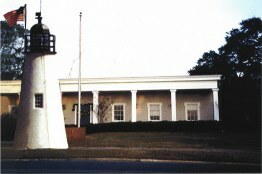 The Light-House Board claimed that Pass Christian no longer rated a lighthouse. As a replacement, buoys and beacons thereafter marked the channel. A public auction was held at the lighthouse on April 18, 1883, and the highest bidder was Lawrence C. Fallon of New Orleans, for $1,225.00 in cash. The sale included the land, buildings, tower, and all outbuildings. About 20 years later the Keepers dwelling was removed and placed at the corner of St. Louis and Henderson avenues. 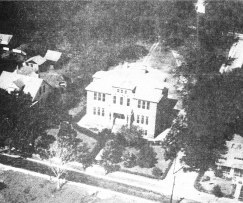 In 1908, the property was sold to the city and expanded to accommodate a brick school building which became the Pass Christian High School. The vacant school building was torn down after Hurricane Camille in 1969, in order to provide a beneficial site for the new Pass Christian City Hall which was dedicated in 1971.